Warli art is one of the oldest tribal arts of India. It is named after the tribe Warli. They hailed from the coastal areas of Maharashtra and Gujarat. Warli has a basic graphic representation: a circle, triangle and a square. It is an earthy art form. A circle represents nature like sun and moon. The triangle represents trees and mountains and the square represents an enclosed space or a piece of land. These pictorial representations were painted only during special occasions like weddings and during the harvest season. I first saw this art in a Chitrakala Parishath Exhibition in Bangalore, India. I have always had a keen interest in knowing the history of different art forms from different parts of India and this interest of mine, made me dig more into Warli art. Now Warli art has been incorporated in textile Industries, in home decor, Jewelry and much more. 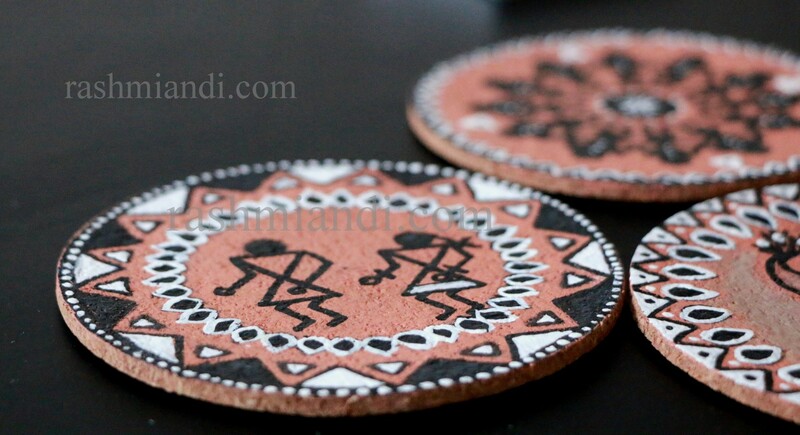 I have used the cork coasters I bought from IKEA into Warli coasters. Well they just looked boring when I bought them, just brown. So I thought of decking it up a little to match my home decor. I have a lot of Paintings and wall hangings inspired from Indian folk arts, so this would just match them. 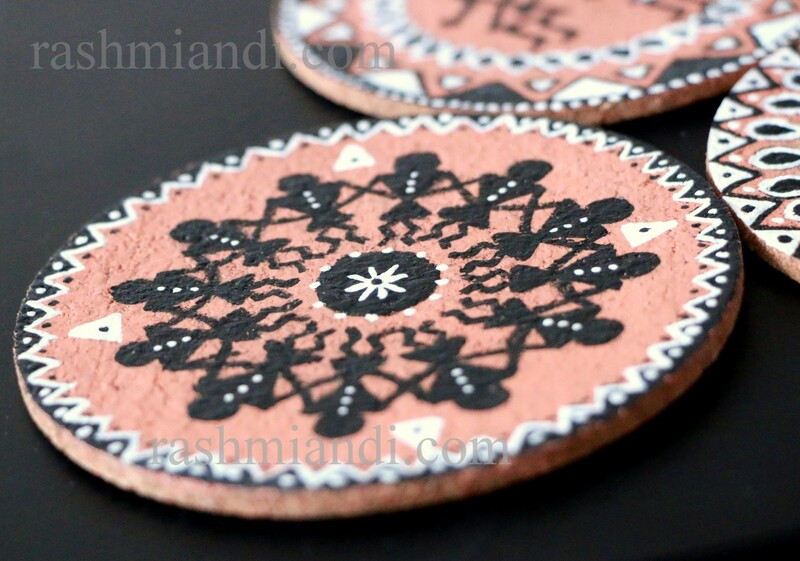 So I have here a DIY Warli Coasters project for you guys. First do a base coat on all your coasters, I took Brown and mixed with White to get a Terracotta color because I wanted an earthy finish. You can always choose to, only do Brown color if you don’t like Terracotta color. Let it dry. Find the center of the circular coaster. (in my case diameter= 10 cm) I used a scale to locate the center basically by intersecting two diameters on the coaster. Draw a circle of radius 4.5 cm which makes space for the border of your coaster. Draw your choice of Warli design or you can always look into my tutorial on Warli for reference. Once you complete your Warli design, allow it to dry overnight. Once the coasters are dried apply mod podge (matte finish). Apply thin coats with 15 to 20 minutes between each coat. Apply 2 to 3 coats. Let it cure for a day, then spray Clear Acrylic Sealer. Wonderful piece of art. I want one of these! Beautiful coasters..worli art is my favourite too. I believe it is one way to conserve our cultural heritage through these art forms. wow these are so beautiful!! amazing art… Now I feel like making them. Let me see if I can find some coasters. Thank you Rajlakshmi :), do try and share your work with me! They are lovely, really. 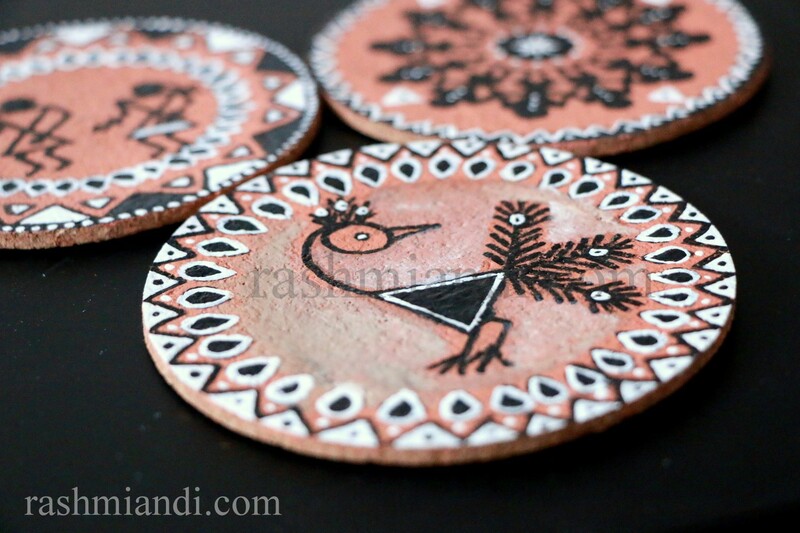 Can I use any other material instead of cork for warli art? thank you Upasna:) You can do this art form on any medium, such as handmade paper, canvas, ceramic tiles, cloth.But the procedures will be different. Hi Rashmi. Loved this! I love Warli art too! Tell me what exactly does Modge Podge do? Hi Kala:) Thank you! Modpodge basically is a decoupage medium, acts as a glue and also sealer. Here in this project it serves as a sealer. Awkward Earthling recently posted…What if ..